Tweet’s Sweets, an up and coming sweets baker in the DC area, was recently introduced to us via email from Baltimore Eats. The owner and head baker, Ros (AKA: Tweety), is passionate about raising awareness and eradicating cancer, so she is using her business to make a difference. 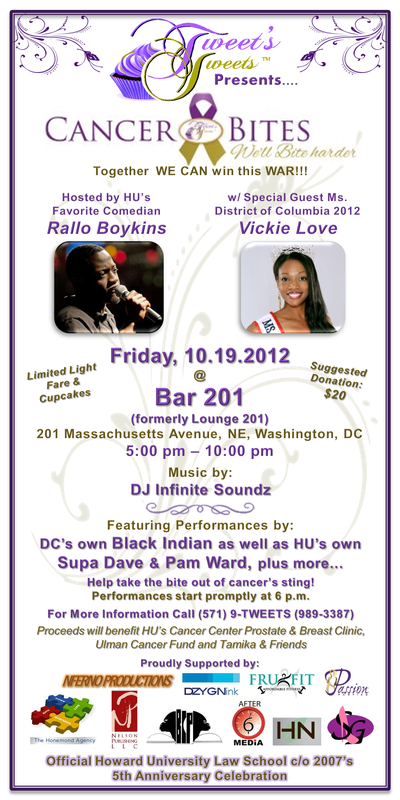 Her most recent event, Cancer Bites: We’ll Bite Harder, located in Washington DC on October 19th, 2012, will raise money to allow patients to seek holistic treatment, pay for medicine, and anything else that often comes up when a person is fighting cancer. What is your favorite cupcake to eat and what is your favorite cupcake to bake? My favorite cupcake to bake is probably the Suga Mama (Sweet Potato) cupcake because it gives off the yummiest smells when it is baking….smells just like my Nan’s kitchen when she used to bake her sweet potato pies. My favorite cupcake to eat is tied between Tweet’s Heart (Chocolate on Chocolate) and MSC (pineapple upside right cake) because I love love love love – did I say love? – me some milk chocolate and (as quiet as it is kept), my favorite dessert is pineapple upside down cake. Can you tell us a little bit about why you are so dedicated to eradicating cancer and helping those who are fighting it? Cancer has come for some people that have helped shaped my life: my grandfather, my favorite uncle, some of my cousins and aunts and now it’s coming for one of my best friends. I hate cancer because it’s one of those diseases that you really can’t protect against. It doesn’t discriminate. It affects the young, the old, the rich the poor, black, white, healthy eaters, and non-healthy eaters. Many lose their battle with cancer because they can’t afford to fight or because they don’t know how to fight. I want to change this….I have to change this. We saw there will be live music and cupcakes at your event, Cancer Bites, We’ll Bite Harder. Can you give us a sneak peek of what cupcake flavors attendees will be indulging in that evening? Lol, I can tell you that the Licia’s Puddin and the Suga Mama will definitely be on site but as far as which other yummy goodness I am going to whip up, readers will have to come out and see and taste for themselves. Do you have any advice to those hoping to raise money or organize an event for cancer awareness and research? I will tell them to follow their heart and to never give up even when it appears like the event isn’t taking shape because organizing a fundraiser is a lot of hard work but the end result is so humbling and so worth it. The fact that folks are even talking about my event that I haven’t even met already makes my event a success in my book. Do you hope to one day own a storefront or would you like to keep your focus on baking and hosting charitable events? Or do you see yourself one day doing both? I am going to open a non-profit that will ultimately host my charitable events but I will continue using my bakery to raise money and awareness for causes that are near and dear to my heart. For more information on Tweet’s Sweets, visit their website or Facebook page. You can also watch a video about Tweet’s Sweets and this event from Washington Eats, here. To donate or purchase tickets, CLICK HERE. We hope you can make it out to Tweety’s event and support her cause!